GTA chief Bimal Gurng announces All Government and Non Government Primary, Secondary & Higher Seconday schools and colleges to remain closed on April 27 & 28 in GTA area for the safety of children from earthquake aftershocks. Degree Exams will be Conducted As per Routine. 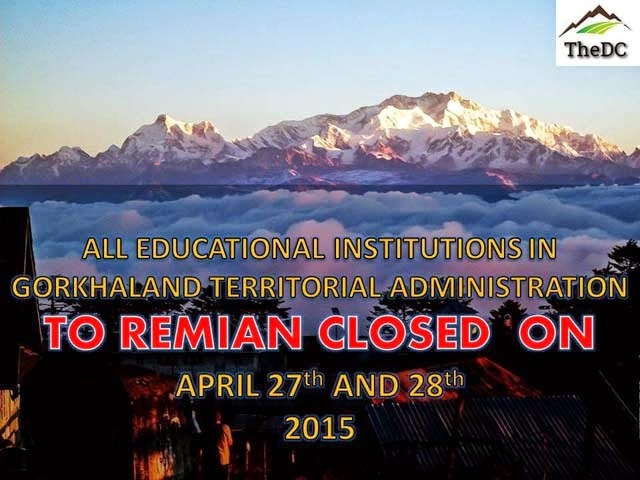 Owing to multiple tremors being felt across the Himalayan region, and the prevailing high alert situation all schools - Primary, Secondary, ICSE, CBSE, Madhyamik, and Colleges across the Gorkhaland Territorial Administration will remain closed on April 27th and 28th, 2015. This is an emergency note from the GTA Chief Executive. GTA chief Bimal Gurng announces All Government and Non Government Primary, Secondary & Higher Seconday schools and colleges to remain closed on April 27 & 28 in GTA area for the safety of children from earthquake aftershocks.